Last Friday, TVB’s Music Director, Tang Chi Wai (邓智伟) held a concert performance in Hong Kong. Numerous artists, including Bosco Wong (黄宗泽), Leo Ku (古巨基), Raymond Lam (林峰), Ron Ng (吴卓羲), Linda Chung (钟嘉欣), Susanna Kwan (关菊英), Wayne Lai (黎耀祥), Alfred Hui (許廷鏗), Mag Lam (林欣彤), Wong Cho Lam (王祖藍), and Stephanie Cheng (郑融) guest starred in the concert performance. 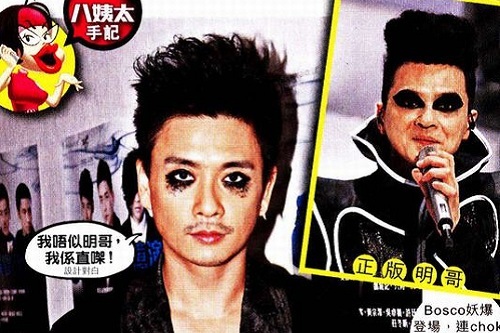 Among the stars, Bosco Wong stunned the crowd with his wicked makeup, effectively stealing the limelight! The other guest performers decided to play it safe in their fashion choices, appearing in mostly white and black ensembles. Raymond Lam wore a black suit and tie, with his hair neatly combed back. He danced and sang onstage for ten minutes. Perhaps Raymond was saving more risque costumes for his May 12th concert at The Venetian hotel and casino in Macau. Leo Ku and Wayne Lai dueted on the theme song for TVB drama, No Regrets <義海豪情>. Due to Wayne’s 48th birthday, Leo changed the lyrics slightly to relay the birthday message, bringing a wide smile to Wayne’s face. Ron Ng sang his classic song, Don’t Blame Her <别怪她> and was out of tune. Apparently, he did not wear a headset and did not realize that he sang off tune. Michael Miu (苗僑偉), Jamie Chik (戚美珍), and Virginia Lok (樂易玲) sat together while enjoying the concert performance. Leanne Li (李亞男) and Grace Wong (王君馨) also attended the concert to support Wong Cho Lam and Linda Chung’s performances. Jayne: I was quite shocked by Bosco’s eye makeup. I wonder if he did it himself? Not really. I’ve watched a Leslie’s show and he wore performing clothes, too. 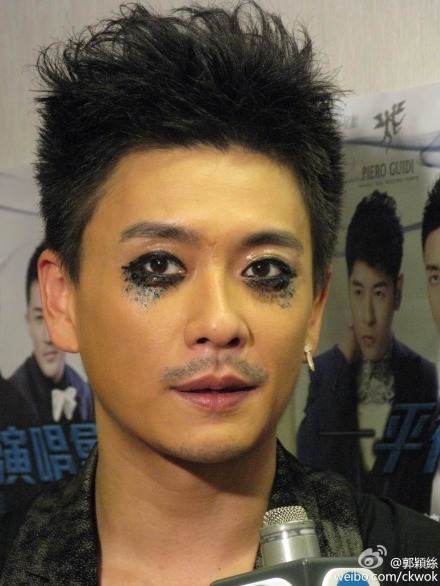 But there is a right and wrong way to wear guy eyeliner, aka guyliner. He has the potential to be the asian version of Joker or the villain Lobo from DC. Yeah, agree indeed not the best dress. The curtain should’ve been removed i.e. show her long legs and high heels plz. Still I don’t get the drag queen feel as I got from the Miss HK pic of Kate & Myolie, LOL. Yes, it isn’t the worst dress of Linda. There are events when she dressed worse. So don’t criticize it too much :). But her singing wasn’t good this time. It sounds kinda chicken voice. I thought she gets rid of it. However, she improved a bit. Not much shaky this time. Just saying that I have seen Linda better, but nobody can compete with your Bosco here la, hehe. Search for it after your complaint and didn’t find too bad. This outfit is also much better, like her belt. Obviously she can’t compete with your 2R, LOL. Thought you were “Mada Okkottemasuka” hopefully I got it right. Do you mean まだ怒っているのですか? aka “Are you still mad?” If it is, then it’s used to describer your feeling is much more correct, exoidus. I said below that Linda’s outfit aka the pants and white shoes on the second day is way better than the midi dress with see-through part on the first day. The dress doesn’t suit her, not that it isn’t suitable for a performance. Basically, Linda only stayed and sang without any other actions, so a dress and high heels are ok for her to move. Bosco did want to have a Rock chic look. And still when Bosco is mine? Lolz, he is Myolie’s :P.
Linda’s singing part is better than Ron’s but still not good, especially when she has this chicky voice again. However, can see the improvement in her performance skill when she wasn’t shaky like a dog under the rain anymore. It’s a bonus point to her. BTW, sometimes I think your reading skill has some problems, exoidus. Ok my bad since you can’t forgive artists that doesn’t treat their fans well right. Well people do misunderstand each other with face to face conversation so no wonder that I sometimes might misinterpret. Besides shouldn’t the writer that some responsibility for writing ambiguous as well? A proof to see that you can’t never accept that you were wrong :). It’s enough to me. I don’t upset at you. Not now, not before, has never. But if thinking that can make you feel happy, I don’t mind. I don’t like being wrong, however I will acknowledge it if true. Huh, how come I will feel happy for thinking you being upset at me? Doesn’t make any sense whatsoever so I should apologize for being wrong. It this evidence enough for you hime-sama? It’s up to you. Done. I’m surprised that Raymond’s mandarin has quite a heavy HK accent. I thought Raymond Lam, being from Xiamen, will have different accent. Is Xiamen a Canto speaking city? Nope, its a Mandarin speaking city. His Mando usually ends up more HK-ish when he’s filming alot and speaks Canto more often. Maybe he speaks fukienese better. Haha, it’s quite cute to hear his Fukkienese. Sound very different. How did Raymond become so fluent in Cantonese? His cantonese is actually very proper, even if with an accent. I find his pronunciation very sharp. I thought he speaks mandarin well. Frankly I know very little about his past. His mandarin is well. It’s much better than his bestfriend Ron whose mandarin is very bad. You wouldn’t believe 2R are best friends lol. He moved to Hk from 2 and only back to Xiamen several time a year. Only during 2 year he went college he was stay in Xiamen frequently. I think his family dun speak Mandarin but Hokkienese aka fukkienese? From the clips about his family they are using it. Maybe give him few months in China and after that he’ll speak Mando without much HK accent. Last time when he had to be in Shanghai for a long while he spoke with Shanghainese accent. Tang Chi Wai’s singing is very good. He has a good singing voice. Bosco is in serious need of a fashion advisor. Am I the only one who find Bosco’s eye make up not that bad? It will be bad if he wear them on the street. But, he wear them for a stage performance. So, i think it’s ok and appropriate. Kidd and fuyuko, you twon could not be any more right. Agreed!!! People need to calm down these days. It is just a BIT OF GUYLINER. Seriously, it is no big deal. @Kidd – because he’s the only one at the concert with wicked makeup. You should watch the picturess and clips. Everyone else look clean and elegant in their suits, jackets and ties. I love Alfred Hui’s 3 piece suit. Ron look good too in his jacket. I found the full vamBoscopire costume! ROFL also got other guest’s pics! Yes, her tacky shoes scream drag queen! Thanks for the full body pictures. Linda’s shoes doesn’t match with her dress at all and she can’t carry the hairstyle. i HATE that hairstyle.. she always choose this hairstyle. She will look better and more feminine hiding her forehead. Did she wore those shoes onstage? She looks better in the second day with pants and white shoes. The shoes is totally odd. And Linda’s body isn’t good for such kind of dress. That’s why she needs photoshop to help in the bath ads. I just saw Linda’s outfit and hair for second. Much better than the first. At least she can cover up her manlier body. if Linda has short hair she will look like wuzun with Wu Zun being the prettier twin ROFL. Her voice is feminine though LOL. She wore short hair wig in that dog series and give an ott performance as a tomboy. Hmmm perhaps Linda should do a G.I Jane role with shaved head? Wait until Linda do this, then we’ll know she can do such action for a role or not. It happened that Linda wore a fake wig for the role in Catch dog :). I’m the second. I think it’s kinda special for a performance. It’s not the makeup I am concerned with. In fact I am ok with it, it is for a concert, it is a gimmick, a show. It is not like he is wearing this every day. I am just concerned with how it is not well applied. It’s like a non waterproof mascara. But anyway what song was he singing looking like this? Would it match the song? Me too, it’s a stage performance so ofcourse he need to stand out la. That’ the only way he can get attention. Too bad Ray still stole most of the attention at this concert! the only way he can get attention ROFL!!! I heard Chi Wai only speak during Raymond’s section and only thanked Raymond at the event but didn’t speak a word in other guest’s performance. He must be only close to Raymond since he did produce Raymond’s album. Ron has the less news and appearance at this concert and he looks unhappy. The only news he got is the negative news bashing his singing. don’t get me wrong by the way. 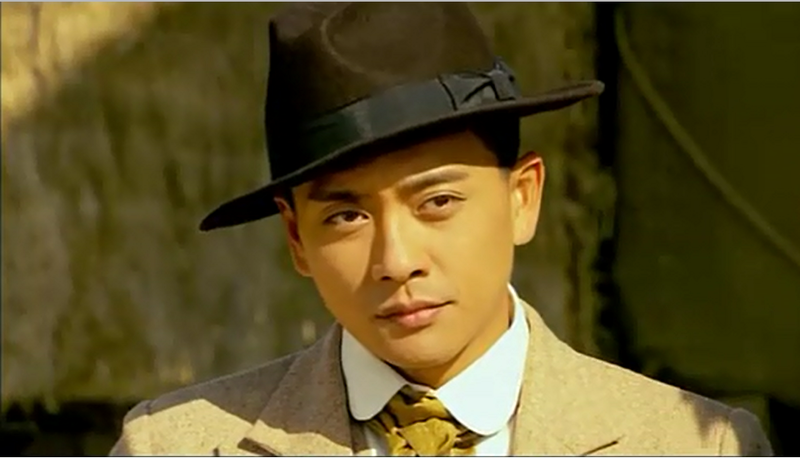 I actually think it’s ok for Chi Wai to be bias at Raymond because Chi Wai did get popular because of Raymond’s popularity. Of course he will love Raymond more than the others. In news I only see pictures of Chi Wai interacting with Raymond alone. not many good news about Ron lately. Everything is so negative: from his gf weibo posts, to his demotion to supporting roles, to crappy acting, and crappy singing…. Yes negative news for Ron all the way including this concert. Viann just make it worse. CW has a little interact with Leo and Wayne. Just a little. Only LF the one who came and told CW to speak, introduced the team. If you’ve listened to Ron’s performance in this show, you can understand why he is criticized. But from the very beginning, Ron was never a good singer and I can’t recall of any time he sang Don’t blame her live without going off-key. Haizz, what’s a pity for a nice voice. He has a nice singing voice but he can’t sing, so he wasted it. The voice is gift from birth. The singing skills Ron need to earn by himself. Maybe take some singing lessons? look the way i see it is, if after so many years of singing and you still haven’t improved aka still crap then just forget singing as a career. Somehow Ron forgot his singing career a long while ago :P.
So basically Ron can’t sing, act and even dance which used to be his forte that good anymore. He should marry Viann, retire and have her take care of him, LOL. It can be a happy ending for Ron, but since he still has something to “sell” and there are ppl who are fancying him, he can survive in the entertainment industry. Yeah you are right, those who Viann calls intelligent fans, LOL. Agreed. LF is the best at this concert and he’s the only one who can make TCW sing! I hate how they criticize Ron at this concert. Maybe Ron Ron should’ve used gimmick like Bosco so people wouldn’t notice he sings out of tune. you might be right. Bosco and his Rock theme somehow made people focus on his appearance and his actions on stage and forgot to judge his vocal abilities, but this won’t work on the radio or on vocal shows. Ron should’ve flaunted his dancing skills that he’s famous with and started with. He finished SSSS so he should’ve time to practice. Ron was famous with dancing at first, but after years without practices, recently his dance move and body move become forced. He hardly can do the actions which need the flexible moves. It’s Ron’s problem. He doesn’t seem to be hardworking on practicing the dance moves. I suggest Ron to never sing Don’t blame her live again. He can’t sing this song properly without going off-key. So he should choose some easier song. Don’t blame her has some high notes that Ron can’t never reach. Isn’t it CW who pick the songs? although I heard stuffs about Bosco and LF pick their own arrangements together with CW but Ron said he’s not familiar with his new arrangement. I’m lost! New upbeat for Don’t blame her. Everyone have new upbeat or arrangement for their songs. I was impressed with Raymond Lam’s dancing, which appears to have improved. All of his back pain seems to be gone! LF is professioanal. Although he has pain he will bite it. I agree with both of you. I also really admire how passionate he is in the arts: singing, dancing, and acting. He is quite talented. I prefer clean-scrubbed Bosco, instead of grungy Bosco. He looks nice in a well-fitted suit. His fashions have been getting increasingly daring. The worst has to be Justin Timberlake’s leotard with high heels combination. I admit too that Bosco does look handsome in his clean moment, but god knows why he keep ignoring public opinion and choose to ‘mess’ up his own looks. Why? He should know by now that audience would prefer clean cut looking individuals more, although Cripple Co is quite good looking actually. Bosco should’ve chosen the more elegant style that Ron, Raymond and others are taking for this concert. He’s the only loner who picked a crazy style. I don’t like the new Rock arrangement for Fortunately, but his second grunge song is surprisingly ok. Although Ron has trouble in his singing, his outfit is good and improved from the fashion show event. Raymond looks good too, better than his own concert costumes. I think differently. His outfit is ok in my eyes for a show while his singing is something can’t say “ok” to it. Like in the Rock version of Hang Yee, he sounds very… uhm… funny. dear bosco, it’s time to get rid of that mustache and please stop trying so hard to be different. It’s ok, we like you no eyeliner and all. Shu is right. It is his duty as an artist to be creative and entertaining to the crowd. How else would he stand out? but he don’t look good in it. Oh btw, Lady Gaga is not original. She’s trying to original for shock value but there are a few that has done that way before her aka the queen of pop herself Madonna. Lady is nothing but the pop version of Marilyn Manson. You want to know how else he can stand out? How about sing well like Adele. She broke all sales records with nothing but her amazing voice. The problem with hong kong singers trying to look edgy is they just don’t seem authentic. And the HK audience well like others focus solely on appearance and not music itself. Lolz, you are talking like other pop music industry dun care for the appearance more than the music now :P. Do you think why Kpop is popular :P? Fox, we are talking about two completely different topics. Kpop is pop music, most pop artists/groups are manufactured by producers and record labels. I’m talking about Rock, real rock music has to come from a more authentic place, your either a rocker or your not, you can’t just put on eyeliners and call yourself a rockstar. Sorry!!! Didn’t mean that! But very funny! Maybe write it better; KRap. Interesting though that HK is a land that idolises idols as in the singers and yet I can’t think of a boy group or girl group, Twins isn’t one since it’s 2. What I mean is Kpop sort of boy/girl group. And definitely no bands. Since the demise (or rather the demise of the popularity of) Beyond, no bands either. It’s a land of solo ballad singers. Yeah, wearing eyeliners doesn’t make one a rocker the same applies to wearing a cap and hip hop clothing and pretend to be one, LOL. not familiar with HK music but wasn’t there a group called butter Cookies 🙂 Well I suppose there were many groups in the seed stage but never became successful i.e known to the general public. Seems to me that one doesn’t need to possess any talent to become a singer in HK as long as you have strong backings. Sigh if this continues all the HK citizens will eat “soft ice cream” every day, ROFL. @Lol: actually i replied to exoidus on the death of hk music industry (if any) due to the development of watching music trend. I dont refer to Rock music. Bosco is indeed a pop star, let’s say so when we refer to his singing career. Most of the famous songs in HK are HK ballads. Twins must be the start of downfall in real music in HK and make more pops and ballads. Cookies is a now defunct girls group from HK. There have been other girls group, but not very successful. Toby Leung and Maggie Cheung Ho Yee used to be in a girls music group too. I don’t remember Toby’s group, Maggie’s group is called PP Gals. As for boy groups, there have also been a few like Boyz, E-Kids, E02. Sorry Fox, it does get a little confusing in here Lolz. It’s crazy the amount money record labels spent (voice coach, image coach, dance coach, clothes, hair…) to manufacture pop stars. That’s why most of these artists seem like they make a lot of money but by the time they pay back their record company…they are broke. Very few make it big enough that they actually earn big bugs and able to negociaite their own deals. Thanks Kidd for your info. Maggie and Toby as former singers just proved my point, LOL. I immediately think of an exaggerated Adam Lambert when I see the eye-liner. But overall, after seeing it on the performance, I think it’s ok. The suprisingly good performance on this show, to me, is Wayne’s. I always think that Wayne can’t sing, especially after his performance with Red Butterfly, but this show changed my view. Wayne sang not bad. Not enough to consider as good but bad is not. At least I can feel that he was singing. The most disappointed person to me, is Alfred Hui :(. I still like him a lot but Alfred’s performance is nothing improved from The Voice. His voice is good, just lack the emotions. IDK if it’s just me but every time Alfred sings, I just get some weird sense/vibe that he tries to look like Raymond? Could just be me. Don’t get me wrong, I like Alfred’s singing. I was just wondering if I was the only one who thinks so to be called “paranoid”[?] (can’t think of word). Well I feel the same thing so you are not the only one. The way Alfred sings is very resemble to LF. I don’t find it’s bad for Alfred to sing like LF (the way of singing, not the voice). I like both’ singing and I think Alfred improved a lot from The Voice in his new album Blue (I’m listening to it). However his live singing is still having the problem he had in The Voice: lack of emotions. I expected more from him. Overall, he has the potential to be a good singer. Honestly, his make-up only looks gothic and to say that it’s clown-like is extremely harsh. As an artist, he has to entertain the audience with different styles and there is definitely nothing wrong with him trying on a new look this time. Plus, I highly doubt that he would be wearing the same type of make-up for the next concert so just enjoy it while it lasts. I think we need some rebels now and then to heat the atmosphere up. Besides, it would be boring for us readers if the only comment/review/scoop of TCW’s cocert was nice or something bland…or at least how I see it. I was wondering if I could watch this anywhere online. If someone knows, do share please! You can find in tudou or youtube or youku. Use the keyword 平行回憶演 or the name of the artist you wanna find in Chinese. Poor Bosco, HK media is just mean & conservative. I’m fine with Bosco’s eye make up- gothic. He is there to perform & “unique” costume/make up is required right to catch audience attention? What the [email protected]#* is that? First he ran around naked in his apartment and got his pic taken and now this? Myolie better have a shrink to check him out. great post is share on this site. thank you for the full body pictures. Linda’s shoes doesn’t match with her dress at all and she can’t carry the hairstyle.